If you are like me, you struggle to find a suitable gift for Mom for Mother’s Day each year. For me its a struggle that comes around every year. I have no idea what to get! For many, not having an idea what to get is the biggest barrier to making a gift selection. I know I have spent hours wandering in and out of shops till they become a blur of items with me no closer to finding the right thing. In today’s affluent society it has never been so easy for people to buy themselves the little things. What was once the item that you wished for and it came at gift-giving time can now be bought at any time. What you don’t want to risk is buying something that will be shoved into the cupboard or even worse re-gifted!! I don’t even have the time to wander around the shops! For some, shopping is an enjoyable thing, but between demands of work, commuting and those essential day-to-day aspects of life that take over as soon as you arrive home. Even the internet may not be the Holy Grail of finding Mothers Day Gifts – web site after web site of product listings is not much different to mind numbing mall walking, except at least you can do it late at night when you should be catching up on sleep. Of course the best gift for Mom is something that is personal, or even personalized. However, it is a balancing act to find something that is personal and that she will like. A caricature will bring your Mother laughter, amazement and joy. I’m almost 100% sure that your Mom does not have a piece of caricature art – and even if she does, this one will be unique! Time is your enemy? well ordering online and letting the artist have the stress is a great way to go! 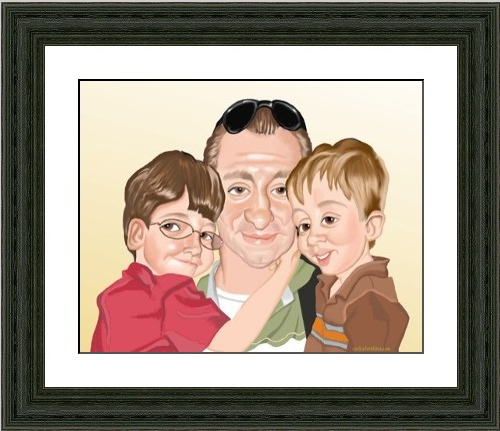 Want something unique – there are not too many caricatures like the one our skilled artists can create for your Mom. And it does not have to be too quirky either. Ideas include a nice caricature showing your Mom in a way that you have the best memories and even with a nice message will bring joy to her heart! Or maybe a nice caricature of the family! The unfortunate part of Mother’s Day is that it is not that far away. Which is a good thing because it means there is still time for you to get a caricature done of your Mom. But only if you order in the next day or so, because you can bet that others reading this are already mentally thinking about what images they can send along with their order. Which is why now is a really good time to go through your pictures and pick one or two that can be used to create your own wonderful caricature gift for your Mom. Find a great pic or two – they don’t have to be of Mom – you could give a caricature of you, siblings, grandkids…!